Charter Oak Mechanical is the number one source in greater Hartford for Ductless Mini Split air conditioners. 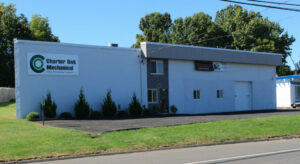 Based in Manchester, we provide HVAC services across the entire state of Connecticut. The Mini Split air conditioners are ideal for buildings that are not suitable for ductwork. Mini splits are great for older homes, commercial or institutional buildings, additions, small apartments, or any room where air conditioning is needed. Ductless Mini Splits are small in size and offer flexibility in zone heating and cooling, with its own thermostat. Since mini splits have no ducts, there is less energy loss than with traditional ducted central forced air systems. Compared with other add-on systems, mini splits offer multiple design options. The indoor air handlers can be suspended from a ceiling, mounted flush into a drop ceiling, hung on a wall, or a floor model option. Split-systems are installed with a small hole in the wall and do not pose the kind of security issues as window or through-the-wall installations. There is generally a lower energy cost with ductless mini splits compared to a window unit. All ductless air conditioning or ductless mini splits will required a qualified installer. At Charter Oak Mechanical our installers are fully licensed and insured. We have installed thousands of units over the years in homes, offices, and institutions all over Connecticut. We have a number of different sizes and brands from which to make your selection and we will find the right unit for you and your budget. Please call Charter Oak Mechanical before the air conditioning season gets underway. Call 860-432-8915 today.